As summer quickly (maybe too quickly?) approaches, most families find themselves spending more time in the great (or in this case swampy and humid) outdoors. 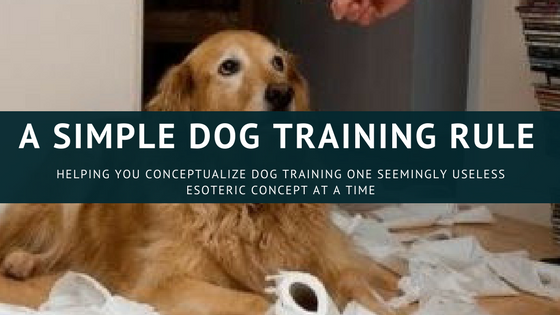 During my dog training lessons, I find myself spending a lot of time delineating various boogies and scary things that can be hazardous to your pooch, and so have decided to dedicate an article to that discussion. 1. The heat: usually when one starts listing dangers to dogs in a certain state, the wildlife jumps to mind. 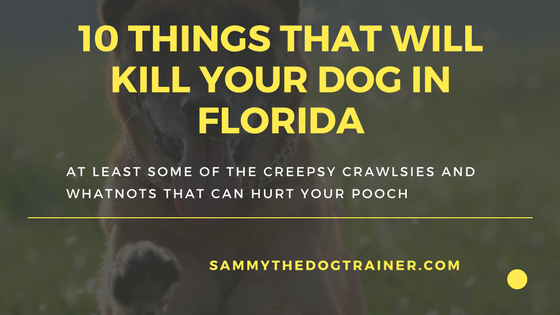 However, probably the single most deadly threat to your dog in Florida is the heat. Most people understand not to leave their dogs in a car on hot days (it only takes about 10 minutes for the temperature to turn deadly). But cars are not the only place the heat can be deadly. A dog perspires through its mouth via panting and its pads of its feet. That is not a whole lot of surface area to expel heat. Add a fur coat to the mix and you have a ticking heat bomb. Many people may think keeping your dog hydrated will keep them from heat stroking. However, it is not a question of water intake (which is still important), but a question of expiration, or efficiently ridding themselves of the water they drank in order to keep cool. No matter how much water you put into your dog, they can only pant and sweat through their feet pads so much. Watch for excessive panting, lethargy, trouble balancing, extreme exhaustion, changes in behavior, rapid eye movement or strange motions. These are all signs of heat stroke or exhaustion in dogs. 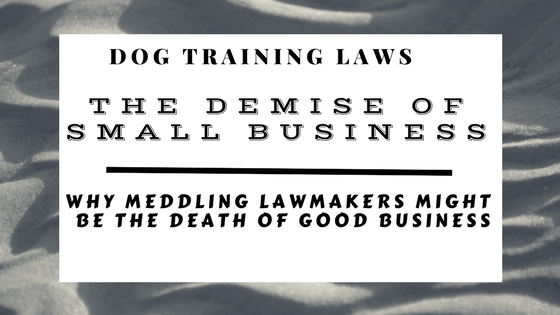 Many dogs (being bred to work and having a keep-at-it attitude) will not quit working until past the danger point, so it is your responsibility to monitor your dog. He might be too valiant a worker to let you know when he starts hitting the wall. 2. Man-made surfaces: Going along with the heat, man made surfaces can be a hazard to your dog. Asphalt and concrete hold heat more than grass and vegetation, increasing the risk factor to your dog. Also, in extreme heat, these surfaces can burn some dogs' paw pads. Some people will go all out and get booties for their dogs. Unless you're doing urban search and rescue, or have a dog with SUPER sensitive feet, you can try using a waxy substance called Musher's to protect your dog's feet. 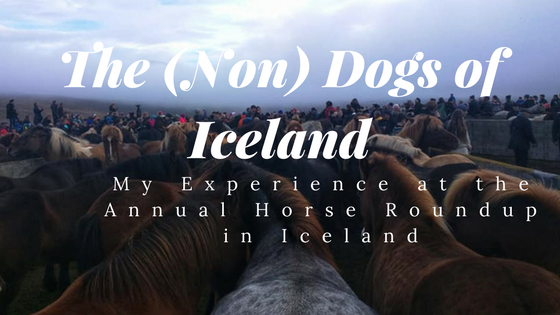 Musher's was originally (surprise) developed by sled dog enthusiasts. 3. 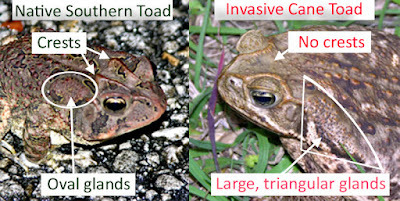 Cane or Marine Toads. 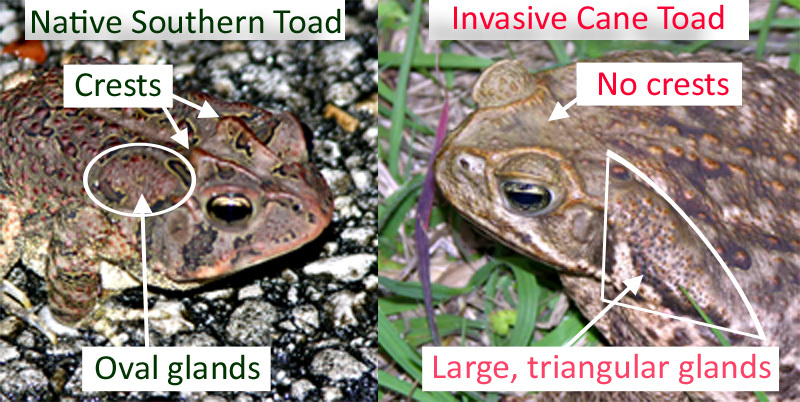 We have several types of toads in Florida. The scariest one for pet owners is the Marine or Cane Toad. You can usually readily identify them because they are huge, nasty dudes. Other toads are smaller. Just to be clear, do not let your dog eat any toad- they can still pack a poisonous punch that will make your dog super sick. However, Marine toads will kill your dog with its poison. Cane toads are also invasive, and wildlife specialists in the area thank you for humanely euthanizing them when you find them (so do dog owners). The recommended way is to put a bit of pain cream on the toad and put it in the freezer. I have a pretty strong stomach, so I have murdered some toads (gasp) in the name of dog safety. One night I caught a toad that was hell bent on assaulting me. This was one belligerent toad. He would not let me get a good look at him in my Tupperware thingy, so I could figure out if he was a catch and release or a death-row toad. Instead he kept trying to punch me with his toady beak. Eventually I gave up and just squirted him with the pain cream, which had an intoxicating effect on Mr. Belligerent Toad. He chilled out enough for me to ascertain that he was indeed a Southern Toad and not a Cane Toad. Unfortunately he was pretty high when I released him in a local pond. Hope he made it. Oops. 4. Snakes. I am pretty sure snakes are hell beasts. No offense to those snake owners out there. I had a boyfriend that made me hold his snake (no, not a dirty joke. His actual snake named Emma). I dumped him soon after. Rattle snakes and water moccasins are the big scary ones in Florida. Check to see which veterinary clinics have antivenom for them if you have an emergency. Not all clinics carry it. Dogs have a higher capacity to live through a venomous snake bite than people do, but it is still life threatening. I try to avoid areas known for having large snake populations. 5. Alligators. Along with snakes, alligators inhabit pretty much any body of water bigger than a puddle in Florida. Alligators will eat your dog. Even your big dog if the gator is big enough. Water moccasins and alligators pose enough of a threat that I would never recommend letting your dog swim in natural fresh water. There are plenty of dog beaches throughout Florida, and some swimming pools will have a doggy day at the end of their swimming seasons. 6. The Water. Yep, the water can kill your dog. Leptospirosis and other terrible bacterias can live in the warm fresh water in the area (oh and to make it more fun, the zoonotic leptos can be picked up by humans as well. Sharing is caring). The salt water can carry some scary bacteria as well. Before bringing your doggo along on a doggy beach field trip, check the water quality at: Florida Healthy Beaches. Anything other than green is a no-go for your doggo. 7. Mushrooms. Certain types of mushrooms can be poisonous to your dog. I do not waste time figuring out which ones are poisonous and which are not. It is death to all mushrooms that crop up in my yard. Check for them after rain or in super humid weather. They can grow quickly. My parents had a dog that died after ingesting backyard mushrooms. It is no joke. Listen to your vet's advice on which heart worm preventative to choose. Use it religiously. Do not be cheap. 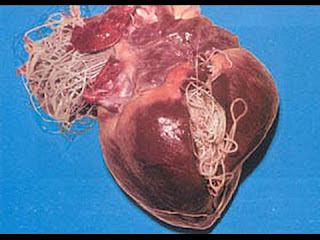 As demonstrated by the picture, heart worms are deadly and super gross. 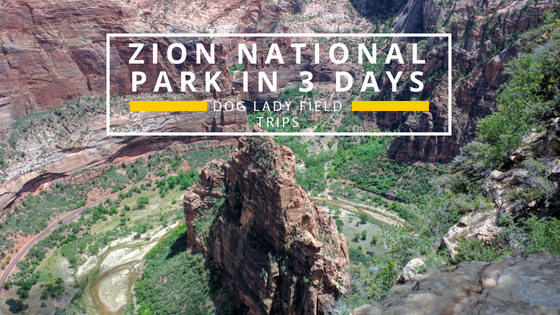 Other parasites and creepy crawlies that enjoy the warmer climes can be prevented by many of the prescribed flea, tick, and heart worm medicines. 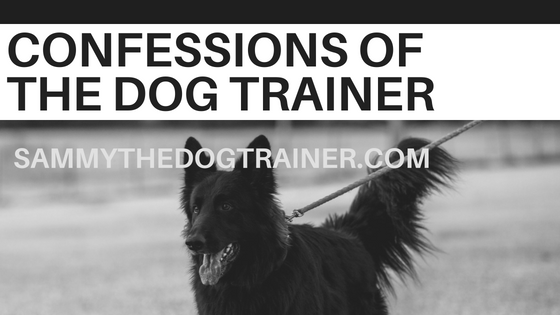 I'm an evaluator for the program if you want to obtain the certification for your dog! 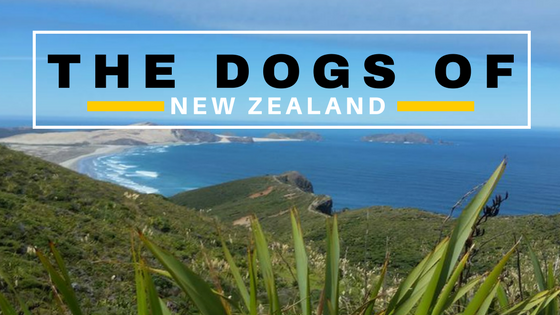 The reason I recommend this is to safeguard your dog. 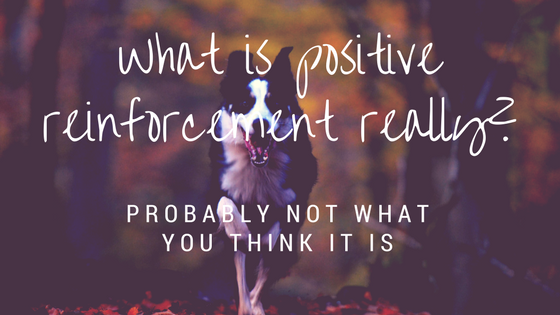 Having documentation attesting to your dog's good training and character can never hurt. There are always creepster people lurking about who will try to take advantage of you. Once I was at a local dog park with my dog. I could see some people milling about on the other side of the fence, noticing my dog (probably the fact that he is big). I got the heebie jeebies from them and my instincts were confirmed when the lady waved me over. "Your dog bit my kid," she announced. She not have her kid anywhere near the dog enclosure. Her passel of kids was climbing on the playground on the other side of the park. My dog did not (obviously because he is awesome and sweet, and I was watching him the whole time) bite anything or anyone. She told me she would keep this information to herself for some money. She was trying to extort me. However when I angrily informed her that my best friend was an extremely good lawyer and I had nothing but time on my hands to make her life Hell, she left without a word. Watch out for people like this. 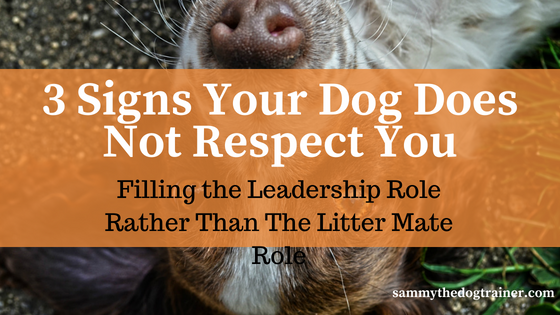 They have schemes set up to try to play on your dog parent fears and take advantage of you. A little common sense, caution, and training can go a long way in keeping your pooch safe. Online pet stores don't have any issue, so they can carry a wider selection of items. Also, while they also can't carry items that just don't sell, being online pets deals allows them to cater to more people, making it more likely that a lot of people from all over will buy the item.